Some UCSF departments consistently reach out out to collaborate with other members of the UCSF community. Here are the top UCSF departments whose researchers have the highest proportion of publications co-authored with people at other UCSF departments. This ranking is based on data is drawn from UCSF Profiles, and only includes departments whose researchers had 100+ publications in 2017. We counted departmental affiliations based on someone’s primary department in UCSF Profiles in April 2018. So if someone subsequently left UCSF or changed primary departments, we wouldn’t count them as part of the primary department they were affiliated with at the time of publication. Or if they published something while at another institution in 2017, but subsequently moved to UCSF by April 2018, that paper would be chalked up their current UCSF department. Learning basic Git is a pretty essential skill for biomedical researchers sharing code—and increasingly, data—with others. At the same time, there are also some hidden implications to using a cloud service provider, including security obligations that may not be well understood. While a well-designed cloud computing system can be safer than traditional client-server systems, when you are considering a cloud service, you must understand the benefits and risks, as well as your responsibilities in keeping sensitive data secure. 1) UC has standard contracts used with providers that protect our institutions’ security and assets. You should always work with procurement so they can ensure that the appropriate agreement is in place. 2) If disruption to services will negatively impact your research or operations, you should negotiate a Service Level Agreement (SLA) based on your needs. However, don’t just rely on the signed contracts – you should always vet the vendors to confirm that they really are protecting our patients and our reputation. Security Risk Assessment service: The security risk assessment helps you measure the security of your system and meet compliance requirements. The School of Medicine Data Security Compliance Program can help walk you through the assessment process. If you don’t have your vendor selected yet and need some help identifying a minimal viable product with a budget and plan? The School of Medicine Information Service Unit (SOM ISU) can help. The average office worker may get over 100 emails per day. Swiftly deleting or ignoring unwanted email can be the only way to stay afloat. These seven best practices will help ensure your email gets opened, read, and acted on — and not ignored or deleted. UCSF researchers often work closely with one another, across departments. 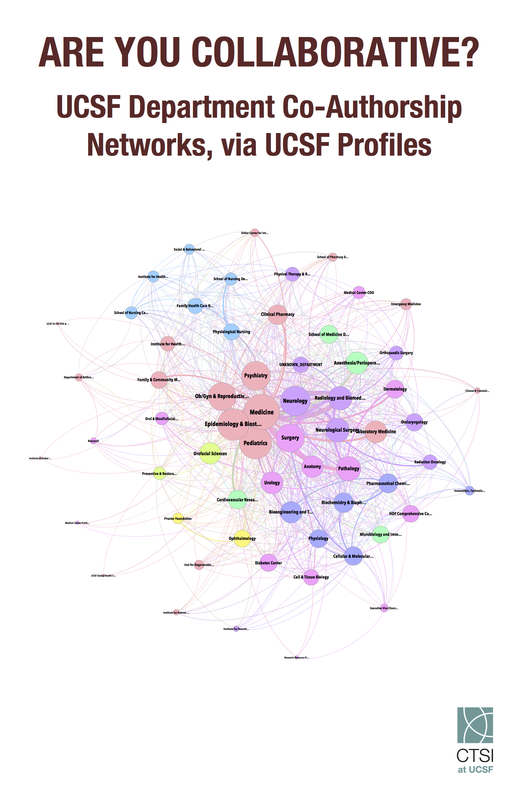 We used data from UCSF Profiles to visualize how different departments work together, based on co-authorship patterns. Visualization details: Data is drawn from UCSF Profiles, and includes all publications co-authored by current UCSF researchers from two more departments and listed on PubMed. The size of each department corresponds with the number of publications that members have published that include partnerships with other departments. The width of the lines connecting departments corresponds to the number of publications between two departments. Colors indicate clusters of departments that often publish collaboratively, based on network modularity. No scaling is done to account for varying sizes of different departments.